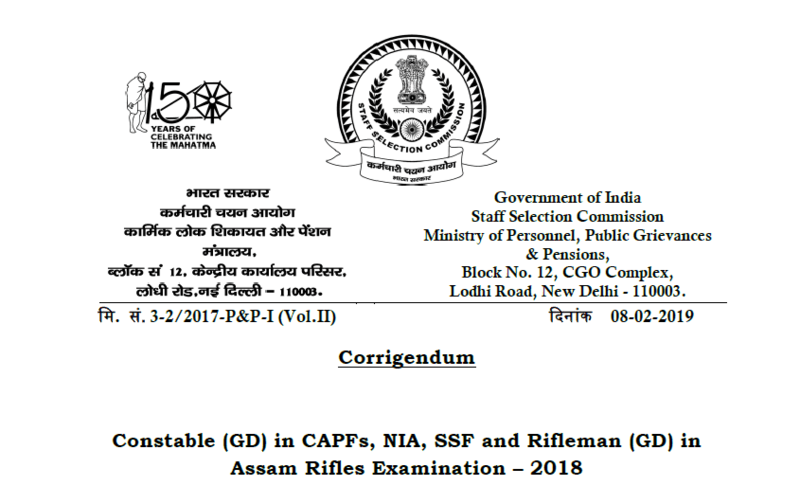 SSC Corrigendum Implementation of Normalization notice for Constable (GD) in CAPFs, NIA, SSF and Rifleman (GD) in Assam Rifles Examination-2018. SSC Corrigendum Implementation of Normalization notice: SSC published Corrigendum notice regarding Implementation of Normalization in Constable (GD) in CAPFs, NIA, SSF and Rifleman (GD) in Assam Rifles Examination-2018. Computer Based Examination for the above mentioned recruitment will be conducted by the Commission on different dates between 11-02-2019 and 11-03-2019. The examination will be held in multiple shifts. As per SSC, "To address any variation in difficulty levels of question papers across different shifts, the scores of the candidates will be normalized by using the formula published by the Commission through Notice No: 1-1/2018-P&P-I dated 07-02-2019. Short-listing of candidates for PET/ PST and Medical Examination will be done on the basis of normalized marks scored by the candidates." Final merit as well as selection of the candidates will also be made on the basis of normalized marks. as per notification, there is no negative marking in the examination.